Not long ago, Violetility, made replicas of weapons you see regularly if you are a fan of the show, Supernatural. Well much to my delight and very many other fans, it’s been done again. This time it’s a replica of what most people refer to as “The First Blade” which was a weapon wielded by one of the very first demons, Cain. 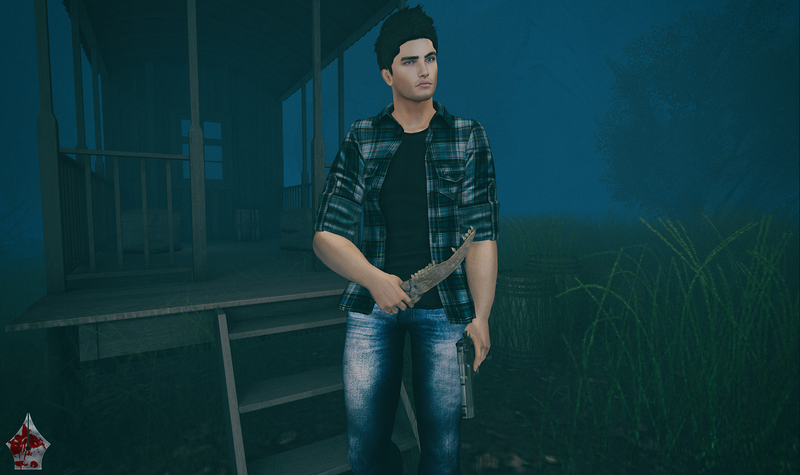 That’s right, you can now own in-world the very blade that Cain and later Dean Winchester used. But beware as this may cause aggression, violence, and bloodlust. I’m very happy that this was made as I have stated in previous entries, I love the show and when I am able to create photos that are inspired by it that it makes me very happy. Quite a few of the items used to create this look have made appearances from previous entries such as the Patrol Plaid Shirt by L&B Swear, as well as the “Joe” hair by BURLEY. Also returning are the “Seattle” boots by A&D because they went really well with the product I’m about to tell you about. It helped forge the Dean Winchester look quite well if I don’t say so myself. At the SIGNATURE Event, A&D Clothing released the “James” jeans. While I am wearing them for the Gianni body as I did get them at the event for that purpose, they are also fitted for Classic (Standard Fitmesh), the Adam body, SLink Physique, and also TMP. Now I know not many people want to buy full packs but let me tell you that doing so for this release would not be a disappointment. Not only do you get 6 colors of jeans you cannot get elsewhere, but the HUD that controls everything has such great options such as belt color, belt buckle color, and also different options for cuffs so if you want to wear different kinds of footwear from shoes to boots you can with ease. Well worth the price in my mind. The SIGNATURE Event is running until the 31st, so you still have time to run and grab these. MESANGE is at the Cosmetic Fair! The “Madrigal Eyes” are available with 15 different colors and the easy to use HUD that those of you who are fans of this brand know about. 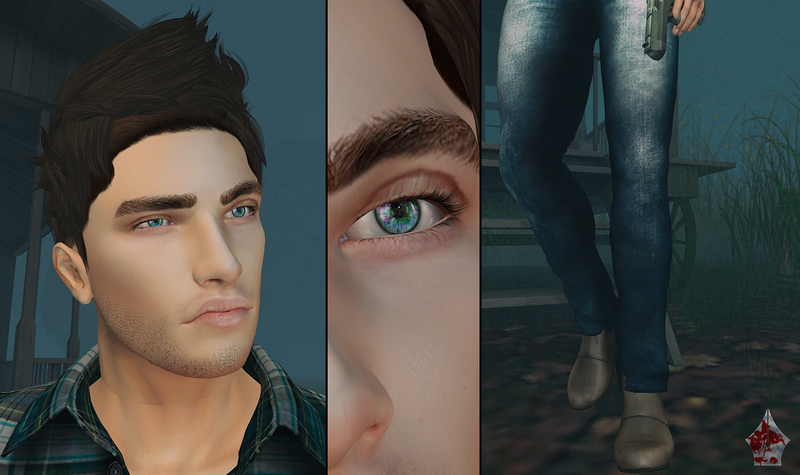 Each individual package contains the standard mesh eyes, as well as a HUD for Omega appliers. For those who pick up the BEAUTY PACK, you also get included in the HUD the ability to apply the eyes to Genesis Lab eyes. Lots of value for a high quality product as you can see from the up close view of them. Also today is the last day of The Crossroads for the January round. Here I am using a pose from the XXY “Wandering” Pose pack. It has five really great static poses to choose from as you can see from the one that I am using. I have so much more that I want to show you all but time is limited so I must send you off on your shopping expeditions while I continue to work to bring you some really great items and looks from favorite designers and events. Maybe I’ll catch you out there but until then as always, stay stylish fellas! Onto the credits, shall we? Photo taken at the Devin 1&2 sim. Previous Post [#330] Your Dream Is Over…Or Has It Just Begun?